Well, it was while working on my “101 Tires” artplay project that I encountered a reverse sort of situation. The project, where I ended up photographing 101 tires on our beautiful beaches, then removing them for disposal, was proceeding along nicely. I was finding them in the most beautiful places on our coast and getting some great pictures and lots of exercise toting and trucking them to the nearest disposal site. Then I discovered Tunitas Beach was the Mother Lode of stranded tires. I got some great photos of tires scarring the foreground with the spacious sandy beach and awesome, sheer cliffs looming in the background. Since I didn’t want to take too many of my photos from one place, I stopped photographing them there, but ended up gathering over fifty more tires anyway, hauling them above the reach of the tide. While this added success to one aspect of the project, that being to remove these eyesores from our beaches, it unfortunately, cut off the flow of tires down the coast to the spots where it isn’t necessary to climb a long, steep hill to gather them. Worse yet, my main stash is still there and barbarians are rolling them out onto the beach to sit on around smouldering garbage fires while they get drunk, then leave them there, and this has required me to re-gather a number of them on several occasions. 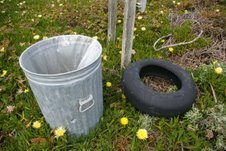 Well, a few days ago Meg, informed me that for one day, on June 21st, the Pescadero Landfill, will give a $7 fee amnesty to anyone bringing in tires. With that kind of incentive, this next week, I’m going to see how many I can carry up the hill in a few hours. I’ve always wondered if I look like what I feel like when I reach the top of that monstrous slope carrying a couple of tires. With Meg’s help I hope to share that. P.S. I don’t have a proprietary interest in the tires left at Tunitas, so if anyone wants to raid my stash, feel free. Especially, that 100-pound truck tire.